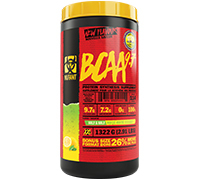 MUTANT BCAA 9.7™ VALUE SIZE! Available in 3 absolutely great tasting flavours! MUTANT BCAAs delivers 9.7 grams of amino acids in just 1 concentrated scoop. Our BCAAs are in the preferred 2:1:1 ratio and then instantized for superior solubility; with added Micronized Amino Support Stack; and finally magnesium fortified to help contribute to protein synthesis. MUTANT BCAAs — beyond just normal BCAAs! When is the best time to take BCAA's? The best time to take MUTANT BCAA is immediately after your workout. However, for optimal results, you can take MUTANT BCAA before, during, and after your workouts. Can I stack MUTANT BCAA with other MUTANT products? You can stack MUTANT BCAA with each one of our MUTANT MAYHEM flavors, as the flavors for MUTANT BCCA match the flavors for MUTANT MAYHEM. You can also add any of the MUTANT BCAA flavors to MUTANT MASS Vanilla, or MUTANT WHEY Vanilla for a different flavor twist to your shakes. Branched Chain Amino Acids are the "Building Blocks" of the body. They make up 35% of your muscle mass and must be present for molecular growth and development to take place. This is essential to every bodybuilder's diet, and should be used on a daily basis. As a food supplement, mix 1 scoop (11.6 g) with 250-500 mL of cold water. Stir or shake and consume during exercise on training days, or throughout the day on non-training days.